Elizabeth Nolan, left, takes home gold in the Trial Lawyers Association of BC Feature Series Award for her three-part series on dying with dignity published last November-December at Saturday’s Coast Capital Savings BCYCNA Ma Murray Awards Gala. Presenting the award on behalf of TLABC is BCYCNA director Karen Hill. The Gulf Islands Driftwood earned three awards at the annual Ma Murray Awards event of the B.C. and Yukon Community Newspapers Association on Saturday night. Staff writer Elizabeth Nolan won a first-place award in the feature series category of the competition for a three-part series on dying with dignity. 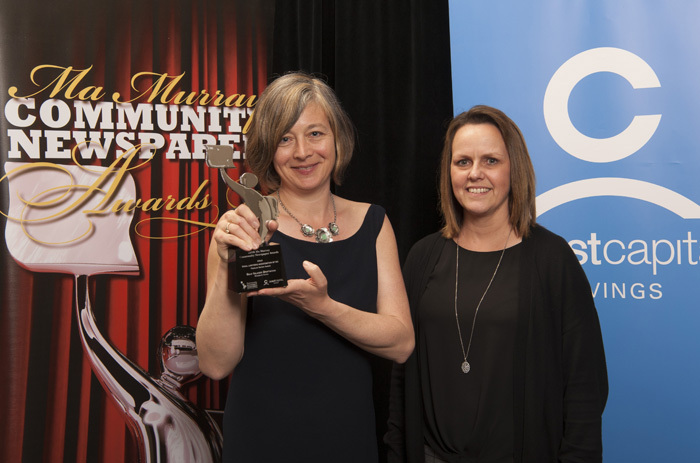 The Driftwood also earned second place for general excellence in its circulation category of 11 papers, close behind the Squamish Chief, and editor Gail Sjuberg won a third-place award for an editorial on the incorporation referendum in an open circulation category. Top-three nominees were released in late February, with the first, second and third-place awards announced at the gala held at the River Rock resort in Richmond. Kevin Lim and Sonia Sidhu, hosts of the morning show on KiSS Radio in Vancouver, emceed the evening. Coast Capital Savings is the event’s main sponsor. National community newspaper awards for 2018 will not be announced until June.